something that i often have in the freezer is packs of chicken thighs and i’m always thinking about different ways to cook them. this week the winning choice involved north african flavours and the development of a dish that i’ll definitely be making again. the gentle richness of the chicken contrasted with the fresh piquancy of the preserved lemons and it is definitely worth using them. preserved lemons last for ages so don’t be put off from making or buying them. if you want to buy them i like the belazu brand. and while you’re looking at their lemons, their rose harissa and smoked chilli jelly are great too. the chilli jelly is particularly lovely with strong cheddar and oat biscuits! finely chop the flesh from inside one preserved lemon (reserve the rind) and mix with the other marinade ingredients. smear this mixture over the chicken thighs and leave to marinate overnight. heat the remaining olive oil, add chicken and cook over a medium-high heat. when the outside becomes golden, remove the chicken pieces from the pan. add the onions and when they begin to soften add the turmeric. cook for a few minutes, stirring. add the chicken stock stir so that all the bits stuck to the bottom of the pan dissolve. pour this onion/stock mix in an ovenproof dish. top with the chicken pieces and cook at 180c for 30 minutes. add the olives and the sliced rind of the preserved lemon. cook for an extra 20-30 minutes. 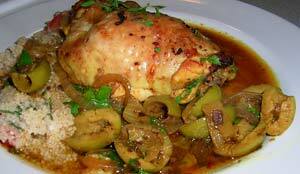 when the chicken is ready, sprinkle with coriander and serve with flatbread or couscous.